Located in one of the most prestigious areas in the heart of Montecito, with panoramic ocean and mountain views lies the Chateau of Riven Rock, Rockbridge. Immaculately clipped hedges border the palatial estate’s stone-pillared entry gates. The entrance opens onto a wide lane paved with hand cut Santa Barbara Stone that leads through a grand archway of undulating trees to the approximately 18,671-sq.ft. main residence. 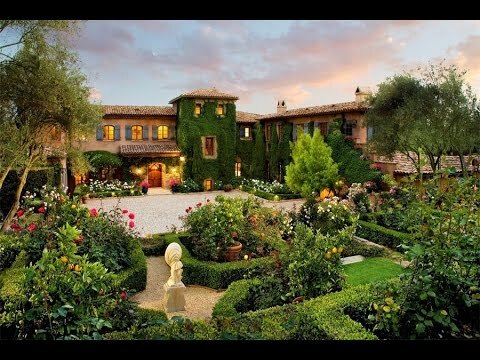 Hidden from prying eyes, the estate sits on an approximate 7.38-acre site with sweeping lawns, tiered rose gardens, tall Italian cypress trees, blooming lavender, and century old olive trees. Designed by Sorrell Design of Montecito, Rockbridge is a concept and construction masterpiece that took nearly five years to create and resulted in a residence without peer.